Brite Ideas Decorating, one of the nation's largest holiday lighting suppliers, presented its top award for its annual holiday lighting photo contest. A western Kentucky company was selected as the best in the nation, out of hundreds of photos submitted from distributors throughout the United States. 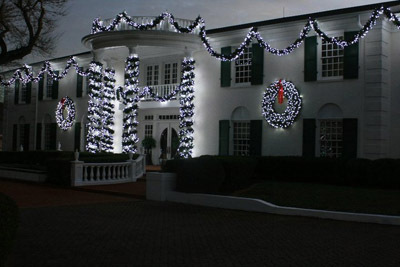 The Straits’ home was decorated with LED lighting, which uses 1/10th the power of conventional incandescent Christmas lighting. “Customers like the fact that they can do spectacular lighting displays on very few power outlets and also be easy on the environment” Stinnett said. Work crews have already begun taking customers lights out of the companies storage facility preparing them for the upcoming Christmas season. “We’ve got hundreds of thousands of bulbs to check out, so when we get to the customer’s site, we know everything is already working properly,” she said. People often ask the company how they decorate numerous sites, often in bad weather? The answer is installation and take down procedures are done in an assembly line fashion. The thousands of light are boxed and labeled and stored in a secure warehouse, which the company owns, “Yea, it gets pretty stressful here at crunch time, but when the lights come on for the first time and you see a kid’s reaction, it’s all worth it,“ she said.